The Port of Cairns (pronounced CANS) is one of the country's busiest cruise destinations with major international cruise ships scheduled annually and its vast array of domestic reef vessels operating on a daily basis. The terminal, located in the heart of the City, is an easy walk to downtown shopping. This modern, sophisticated city with its extensive shopping and dining experiences, magnificent mountain backdrop and direct access to the Great Barrier Reef and World Heritage Tropical Rainforests makes Cairns an extremely attractive cruise and fly/cruise port. The Port provides capacity for up to two cruise vessels located along Wharves 1-5 with a dedicated cruise terminal of Cairns on Wharf 2/3. Some of the bigger ships cannot get in as the channel into the port is very long and narrow. They also have to be of a size that will let them turn around in the river, otherwise, they will be anchored and use tenders. Cairns International Airport is located just 8 kilometers from the City. Taxi: The average fare from the airport to the city is $16.50 by Black & White Taxis. Check here for festivals and events in Cairns when you are in port. Cairns is a small city with a population of approx. 130,000 that is very focused on the tourist industry, but is also surrounded by agricultural activities including sugar cane, banana tropical fruits, and now boasts the word's first tropical fruit wine region. Cairns is popular with international tourists, particularly the Japanese. There is a lot of budget accommodation with plenty of drinking establishments and cheap restaurants for backpackers. The atmosphere is relatively inexpensive tourism, with t-shirt shops and lots of clubs and places to go out for young travelers. The Skyrail Rain forest Cableway is one of the most scenic ways to travel from Cairns, climbing up above the rain forest canopy to the charming mountain town of Kuranda. Kuranda Scenic Railway provides a historic, scenic journey between Kuranda 'The Village in the Rainforest' and Cairns, traversing the walls of the Barron Gorge National Park, through hand carved tunnels and past tumbling rainforest waterfalls. Or combine the two. Great Barrier Reef trips leave from the pier where you arrive (you can book them there, too). A trip to the Great Barrier Reef is a must do for any visitor to the region. It takes about one hour to get to Green Island. Reef Fleet Terminal: With Cairns ideally positioned on the doorstep of the Great Barrier Reef, the Reef Fleet Terminal enhances the passenger's experience providing the ultimate departure point to the Reef. 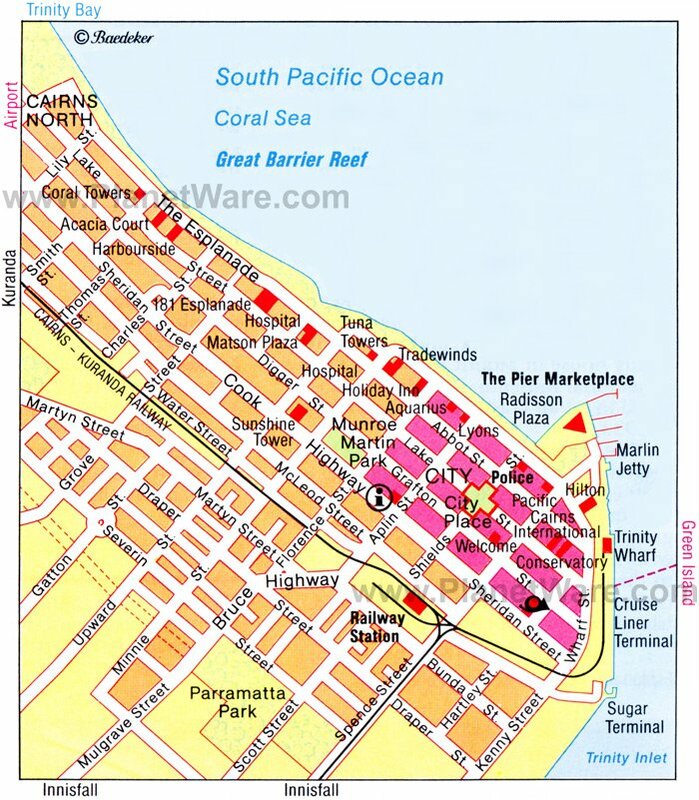 The Reef Fleet Terminal is located at the end of Spence Street, between the Pier Shopping center and Cairns harbor Lights and adjacent to the Cairns Marlin Marina. About 20km from Cairns, the Crystal Cascades are a series of beautiful waterfalls and pools. Avoid jumping off the rock cliffs here. The area is accessed by a 1.2km (30-minute) pathway that’s suitable for wheelchairs.